Around three weeks into the September term, I lost the will to live with packed lunchboxes. The novelty had well and truly worn off for both of us, and The Boy had ventured into the realms of not wanting to try new things. I managed to have one or two variations of sandwiches throughout the week, but the joy of making his lunches was waning. And I couldn't be faced with finding out that he hadn't eaten his lunch, as a teacher I know the importance of children keeping their metabolism and strength going throughout the day via a quality lunch. That's when I discovered a few simple tricks of using cutters for his sandwiches, buying some fun food picks to decorate the cake or cheese, putting fruit sections into small lidded pots and I bought a fabulous panda-bear lunchbox online. 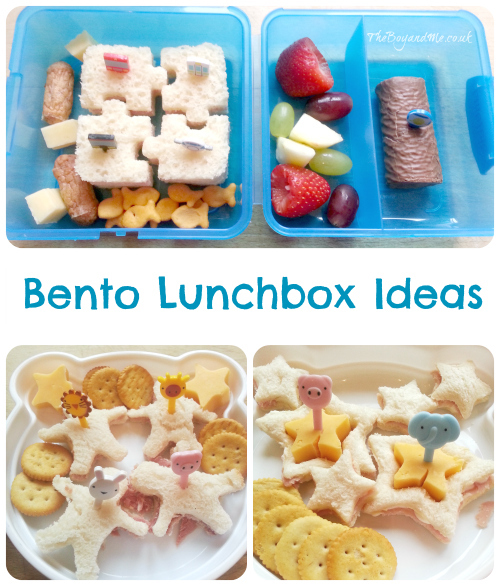 I've had many a discussion with Capture By Lucy who is a huge advocate of the Bento styling of lunches, and has even started her own project aptly entitled Bento Babies. I didn't get it at first, she knows this. There are some aspects that I still can't see working for us (the food would just fall out of the silicone cases and go all over The Boy's lunchbox, with my luck I just know it would! ), but Lucy has helped me gradually see that there is a more fun way of presenting The Boy's food. That's why last week I invested in some new food equipment for The Boy to see us through Spring and Easter. I found a wonderful small business via twitter called Eats Amazing which sells a plethora of bento items including silicon cases, food picks, small containers and pots; all perfect for children's lunchboxes! There will be more to come on that in a few more weeks. Fancy lunchboxes aren't necessary at all as one of ours was bought from Asda for a couple of pounds, but cookie cutters and one or two food picks can make the normal floppy bit of bread and ham look a lot more enticing! Hooray! I love your Bento ideas and there are so many ways to present their food you never run out of ideas! I'm such a fan of bento lunches. It's the only way I can get my three year old to try new things. And your new blog look is fantastic. There's something about it that's so calm and really lovely to look at.